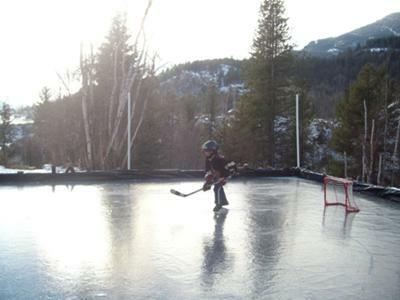 I've always wanted to have my own back yard rink so I decided this was the year. Well actually, I decided last year was the year but I failed miserably. So I decided, this was the year. I did my homework this time, asked around, and found that the best way was to basically build a shallow pool around 6"deep, fill it up and let it freeze solid. I purchased poly and began construction of little boards made out of left over i-joist I had from building our house that would contain the water and of course help to keep the puck in play. 140 linear feet of boards and days later I finally got it all put together and secured everything with braces/screws etc. The rink ended up being 44 feet x 27 feet so it was a pretty good size as far as backyard rinks go. With the rink being 27 feet wide it turned out that our yard sloped away from the house a lot more than I thought it did. By the time I'd finished and leveled the boards it would be yes, 6" deep on the house side of the rink, but closer to 28" deep on the other side. I'd started just wanting to play hockey, but I had emerged an architect. Once the last screw was in place I proudly stood back admiring my thorough craftsmanship. It was perfect, AND, it was ready for water. It was around dinner time when I began to fill it...and fill it, and fill it. I went out that night a number of times to check on its progress and each time I came back in the house I was more excited than the last. I said to my wife, "I cant remember being this excited about anything!" I felt like I was six years old on Christmas eve. I headed out one last time before bed. Standing there in the glow of flood lights I watched as steam rose up into the darkness. The reflection of the boards in the water teased me with anxious anticipation. Ice was on its way, OH YES, ice was on its way. It was late so I killed the lights and headed off to bed all smiles and feeling 100% Canadian. Twelve hours of filling later it was STILL a few hours away so I headed off to work with plans to come back around noon. It was around 10am when my neighbor called me and asked "Are you still in town?" I knew it was bad news. He said he was sitting in his nook and he heard this really loud snap, quickly followed by multiple snaps. He walked to the window just in time to see the actual curl of the tidal wave as it tsunamied its way down my back yard carrying sheets of ice and the broken remains of my perfect boards. I drove up to the house, walked into the back yard and hung my head in devastation. It was gone. The weight and pressure of that much water was just too much for it. Broken wood and braces lay strewn all over the back yard with sheets of ice an inch and a half thick everywhere. It looked like a bomb had gone off. Not only would it take me a long time to put this back together but I was crazy busy at that time of year with my job. I turned away, turned off the water, walked back to my car and went back to work. So after my day at work I took some time to collect myself and returned home to begin the disaster clean up. I walked around the corner of my house afraid to look up. When I finally did, for a moment I actually felt like I was dreaming. The boards were all reassembled and put back where they were originally. I actually felt a lump in my throat for a moment. My neighbor Ken had spent the afternoon piecing the entire thing back together. But this time he built gussets for the corners and used small trusses and rebar to secure the boards to the ground. I mean, come on!!! What a guy. We added more rebar, checked for holes in the plastic and about an hour later we began filling it, again. Days later, with the ice not quite thick enough to skate on, I was just about to leave to take the kids to school when I noticed the plastic had blown over the left corner of the boards and was touching the ice. Can't have that. I assured the kids they wouldn't be late for school and then ran into the back yard and around the back corner of the rink. I have never wiped out like this in my life nor do I think I will ever wipe out like this again. I was in close to a full run on my lawn wearing dress shoes when I hit glare ice. In a mili-second my feet were close to directly over my head. It happened so fast that the only thing I could do was to say "UUUUNGGH!" when my face and lip bounced off the ground. Of course I quickly darted up with no expression on my face and immediately looked everywhere to see if anyone saw me. Completely dazed, I thought to myself "Okay, how many teeth did I just lose?" Once my body began to come out of shock I started laughing. Soon after, I realized I had a fat lip, soar nose and a minor shoulder injury. No big deal, I'm a hockey player for Christ sake! The weather wasn't cooperating and it was looking like we weren't going to have ice over the holidays but a cold snap came through at the perfect time and we had our first skate Christmas morning. I think the hockey gods smiled on me. Well, I'm sure they laughed first, but then they smiled. The kids loved it. My wife and I loved it. Complete with Christmas lights and music we rushed out to skate every chance we could. Together with friends and family, we played a hockey game on New Year's Eve and lit fireworks off the corner of the rink at midnight. It is a memory I will never forget. So yeah, what an ordeal. It was nuts. Would I do it again??? Absolutely :) Wow, that ended up being quite a long story. I thought you fellow rink builders might get a kick out of it though. I've added a picture of my son on the ice.